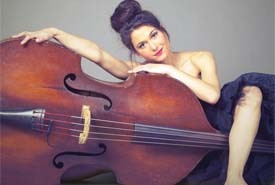 Bassist, singer, composer, BRANDI DISTERHEFT, has been under the apprenticeship of Miles Davis' bassist, RON CARTER, since she relocated to NYC from Vancouver. It's not only her fiery bass playing that make audiences stand-up and holler, but also her innovative live shows as she sings in both English and French showcasing her ambient and dreamy voice. Winning a JUNO (Canadian GRAMMY) for her "Debut" album, Brandi had the honor of recording and performing with Hank Jones, Anita O'Day, Benny Green, Cyrus Chestnut, Jeremy Pelt and Renee Rosnes to name a few. At the tender age of 21, she had already performed at some of the world's most prestigious venues including Carnegie Hall and the Vienna Opera House. Along with her regular residencies at NYC jazz venues, 2018 also saw Brandi performing at Birdland Jazz Club in NYC, the Festival International de Jazz de Montreal, the Vail Jazz Festival in Colorado, as well as engagements in the UK, Australia, New Zealand and China.